TIP: Don’t let learning how to create a blog overwhelm you! Trust the process. You’ll get there my friend! I remember how it was when I first started. To think that I am now making money from blogging is a dream come true, and it can be yours too. Follow along! TAKE YOUR TIME AND REALLY THINK ABOUT THIS ONE! You don’t want to have to re-brand later, although it’s possible to do. Is your blog based on a particular niche? Do you think you might want to write about other subjects later? Look at a thesaurus. Ask your friends. Spend some time thinking about domain names that stand out in your mind. Why do they stand out? I spent WAY too long trying to come up with a domain name when it was sitting right in front of my face. 1fungrltravels, albeit harder to spell at times, is an account that already had a scoial media following, so I went with it! A blogging platform is the service or software your blog runs on. Think of it as the housing frame that keeps your home together. Popular blogging platforms include Blogger, Tumblr, Squarespace, TypePad, and my favorite structure that keeps my home from falling apart, WordPress. WordPress may be a tad more technical, but it often regarded as the best platform to use, particularly if you believe you might want to make money from your blog! Now there is a huge distinction between wordpess.com and wordpress.org you need to know about.. It confused me so badly when I first started blogging so don’t feel alone! I’m not a techy and I started my blog, SO YOU CAN TOO! Learning how to create a blog can be frustrating at times, but the immense knowledge you gain along the way is well worth it! Be patient! *Hosted blogs are referred to as WordPress.com blogs. Self-hosted blogs are often referred to as WordPress.org blogs. You CAN”T make money from a WordPress.com blog but you can transfer your blog to be self-hosted down the road so don’t fret if you change your mind. A host provides server space so that others can find you on the internet. Think of the host as the construction worker who comes into your home and maintains the structure on a daily basis. Sounds intrusive, but stay with me. I want this analogy to make things easier for you to understand! There are several hosts to choose from this day and age, and while everyone has a different opinion as to which is the best, my current host is Siteground. They do an excellent job, and my site has never crashed, which is very contrary to what I hear from people who use HostGator or BlueHost. YOU GET WHAT YOU PAY FOR! CLICK HERE to sign up for Siteground hosting TODAY! However, I recently discovered WP Engine and am certain I will be switching to them! There are several reasons for this. 1. They specialize in hosting FOR WordPress specifically so they are WordPress experts. 2. Trust me when I say that migrating from a free WordPress.com site to a self-hosted WordPress site is a huge hassle (been there done that) and they have it streamlined! Best part of all of this?! Sign up now with me now to get 2 free months of hosting with WP Engine on any shared annual plan! CLICK HERE to receive 2 free months of hosting on WP Engine for any shared annual plan! The next step, if you chose a self-hosted WordPress blog, is to actually start blogging! Although I do not have an in-depth tutorial on how to do so at this time, I highly recommend THIS ONE from Dart-Creations that takes only 2 minutes! Okay, we’re almost there! You have your home set up, but you’re missing a vital aspect, and that’s decorating it! In this analogy, we’re using WordPress themes to design our blog. Of course, there are a few free themes that come along pre-packaged with WordPress, and my own blog is actually a free theme. Many people will claim it is better to pay for a theme, because you then have access to support. This is actually a very valid point because there were many MANY times I wanted to curb stomp someone out of frustration and didn’t know who to talk to. A great site to consider when selecting the perfect WordPress theme, and when learning about WordPress in general, is WP Beginner! In fact, if you CLICK HERE it will take you directly to things you should consider when selecting a theme. Keep in mind, selecting a theme depends greatly on what you are blogging about. You are ready to blog now! Get to writing. Seriously, stop procrastinating. Just START! I him-hawed around for YEARS before I realized I could actually make money from something I loved to do and I PROMISE that you can too. Just stop worrying about making it perfect and let go of the fear holding you back. You got this! A thousand miles begins with the first step, and you’ve just took your first step in the how to create a blog journey. I’m readily willing and able to hold your hand through it! Next steps? Check out my post on surefire marketing tips for new travel bloggers! the majority of the advice applies to ANY type of blogger! 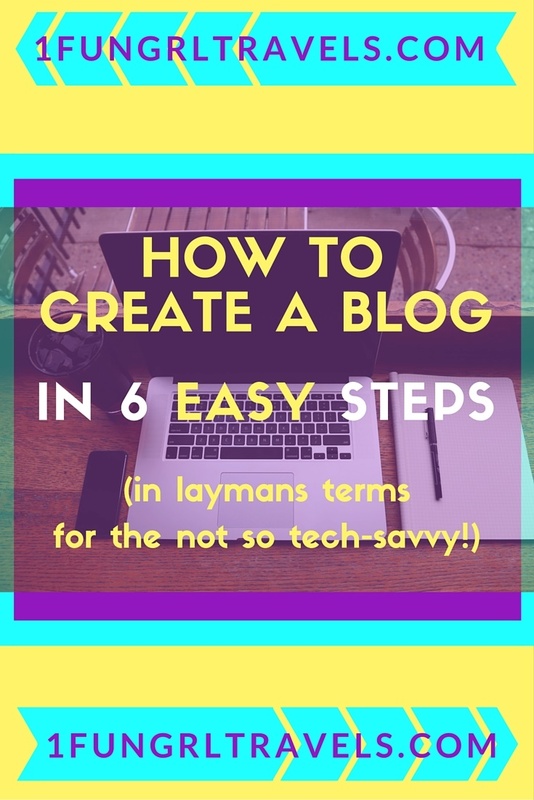 Thanks for checking out how to create a blog in 6 easy steps! Are you ready to start your blog today!? If not, let me know what’s holding you back!